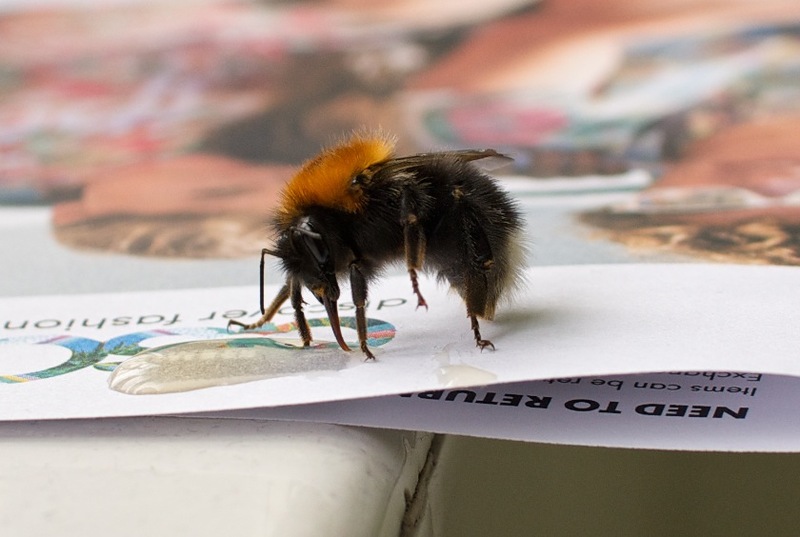 I noticed a bumblebee in the house, seemingly exhausted - I had to gently nudge them to even realise they were still alive. Carefully, I picked them up on a piece of paper, and left a few drops of sugar syrup for them. A few minutes later, I went back to check up on them, and found it being hungrily slurped down. They've had their fill, it seems - now, they're wandering around the sill in the bathroom, occasionally buzzing briefly, as if warming up. ETA2: nope, they were caught in between the bottles of bubble bath - I thought I heard some energetic buzzing, and eventually found them. They did seem to have energy again, though, with a lot of hovering-level flight, so I lifted the bottle they'd semi-attached to, and hoisted it to the window. Sure enough, they went buzzing off loudly into the big wide world. Oddly enough, I found a bumblebee in my basement today. I squished it. My neighbour's horse chestnut tree is in bloom and the bumblebees love it! I wish I knew where the nest was, though. Eep! Aw, poor thing. But, I suppose, they're not huge - it's a good thing I spotted "mine", lying by the toilet doorway, seemingly exhausted. Aww, so nice of you to offer them refreshment. :)I'm sure they appreciated it! It was quite a transformation. ^_^ Certainly took in quite a bit of the syrup - caramel flavor syrup meant for espresso drinks, actually, but I'm hoping the flavoring and coloring won't be any problem. Toward the end, they were happily maintaining a good, healthy hovering buzz, compared to barely walking around at the start. And getting some reasonable shots out of it doesn't hurt, either. ^_^ Wound up taking another few, this time with the 120-300mm f/2.8 and a 12mm extender - still not really a macro lens, but a bit larger magnification than the 30mm f/1.4 can manage. 1) Beekeep uses neonicotinoid on colony to control mites - it's added on a brush at the entrance to the colony to comb through the bumblebee's fur and help kill mites. 4) Bees are given honey based on the faulty dance and only have enough energy to get part way to the flowers. When they run out of honey they can no longer fly and seem totally lethargic. I applaud your bee-helping and I think you are still doing a great thing because there might have been a possibility that the colony is healthy and the bee was just lost while scouting. This summary was brought to you by a candle-maker who regularly attends apiary conferences. The beekeeper association he belongs to has known this link to neonicotinoids for over a decade but they have been silenced by the corporations that benefit from it. Sadly, something like my summary is VERY hard to find online, any time the CCD page on Wikipedia is edited to talk about it there is no 'evidence' from third party sites to corroborate it, which makes it infuriating to actually try to tell the internet the truth in this regard. I was so upset when Dr Who even commented that he didn't know where the bees were going and I was yelling at the screen telling him to hang out with people at apiary conventions. That's cool — and good on you for saving a fellow animal's life. I've tried this before once, but then found that the insect in question had simply expired next to the sugar syrup. At the time I attributed it to the syrup, figuring that my common-sense guess that sugar syrup'd be good for a hungry insect had been wrong, but perhaps it was just coincidence.